It’s funny. I’ve spent the entire week thinking, quite a bit, about webcomic peripherals. The little things that are part of the web experience – that, in many ways, help define webcomics as seperate from print comics. You’ve got the basics – things that are pretty much just requisite, such as a good archive system, decent layout, cast pages, and a forum / email / tagboard or some other form of contact and communication with the reader. You can get by without them – but these are the building stones of a good site. But the things that has been running through my mind has been the goodies, the extras. Newsposts that are as humorous in their own right as the comic. Fan art, side strips, puzzles, games, alternate scripts – the whole shebang. And alt text. Man. I’ve recently fallen in love with alt text. Some comics just use it for a bit of witty explanation, but in the hands of a master it can add an entire new level to the joke. I mean, we’re talking about comics that already twist ideas in ways that I have trouble following, and here’s a chance for them to finish up with a final one-two punch. Or one-two punchline, as the case may be. 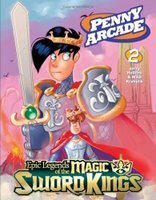 Unfortunately, after spending all week pontificating on this, my train of thought on these web-only wonders was completely derailed yesterday when I picked up Penny Arcade Volume 2: Epic Legends of the Magic Sword Kings. …though I suppose I did just describe it. Hmm. Hyperbole or not, the book was more than just a collection of strips, just as all the quality webcomics online are more than just a series of pictures. And I began to wonder if the real lesson wasn’t about the medium, but about the creators – the artists behind webcomics have a tendency to love their works. To want to make more out of them. To add in historical backgrounds and imaginary blogs; to lay out lengthy story guides; to both create and invite guest strips; to explain how they create their art; to produce livejournal icons, animated strips, podcasts. That’s a lot of extra effort they put into their works, well and beyond the already pretty momentous production of the comic itself. And, well… I guess the only real point to all this is to say that it’s appreciated. I like finding the easter eggs, reading through the extras, downloading the wallpapers. I like the immersion into the strip. I like that for a lot of webcomic artists, it goes beyond just creating a work – it becomes about creating a community, and building attachments with the reader. That’s a really good feeling. I guess I can’t stay safe in my assumption that nobody knew it existed, and therefore I could quietly let it fade into the distance. Well, I hope you’re happy! Now I’ll have to update the blog this Sunday. I may go so far as to do so on a weekly basis! People who hide jokes in alt-tags should be drawn and quartered! People who hide jokes in title-tags, on the other hand, they should be getting awards.